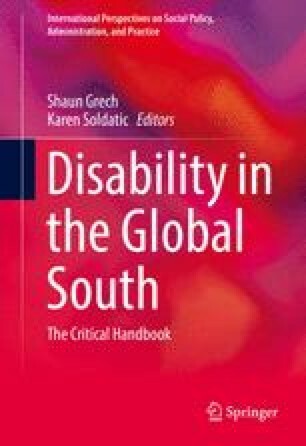 This chapter maps aspects of the gendered experiences of living with and alongside disability in the global South and highlight openings in related feminist analysis. There are two main foci: 1. Challenging universalized views of disability by questioning how women with disabilities are positioned, especially in the global South, and how their positionality, subjectivity, and intersectionality are understood in light of shifting global forces. 2. Addressing the feminist critique of disability, as it incorporates new gender theory and a broadened geopolitics of globalization via feminist postcolonial and postconventional thinking(Shildrick and Price 2005; Parekh 2007; Meekosha 2011). These theories have opened avenues for a provisional politics of embodied interdependency and transformative connections which lead to hopes of a geopolitically aware ethics of flourishing (Campbell 2011; Puar 2012a; Shildrick and Price 2005). Akram, A. (2011). The role of women with disabilities in community based inclusive development, March 2011. Barbara Faye Waxman Fiduccia Papers on Women and Girls with Disabilities, Center for Policy Studies. Retrieved October 21, 2013, from http://www.centerwomenpolicy.org/programs/waxmanfiduccia/2011OnlineSeriesBarbaraWaxmanFiduccia.asp. Al Jazeera and Wire Services. (2014, October 31). CEO blamed for Bhopal gas disaster dies. Retrieved November 2, 2014, from http://america.aljazeera.com/articles/2014/10/31/warren-anderson-bhopal.html. CREA. (n.d.). Retrieved February 6, 2015, from www.creaworld.org. Daly E. (2015, April 22). Witness: Rana Plaza factory collapse still plagues survivors. Human Rights Watch. Retrieved June 8, 2015, from http://www.hrw.org/news/2015/04/22/witness-rana-plaza-factory-collapse-still-plagues-survivors. Kamga, S. A. D. (2011). The rights of women with disabilities in Africa: Does the protocol on the rights of women in Africa offer any hope? Centre for Human Rights, University of Pretoria, February 2011. Barbara Faye Waxman Fiduccia Papers on Women and Girls with Disabilities, Center for Policy Studies. Retrieved October 21, 2013, from www.centerwomenpolicy.org/programs/waxmanfiduccia/2011OnlineSeriesBarbaraWaxmanFiduccia.asp. Maxwell, J. & Constantine, S. (Eds). (2007). A health handbook for women with disabilities. Berkeley, CA: Hesperian Foundation. Retrieved October 24, 2013, from http://en.hesperian.org/hhg/A_Health_Handbook_for_Women_with_Disabilities. Miss Landmine Cambodia. (2009). Retrieved February 7, 2015, from http://miss-landmine.org/cambodia/index.php/candidates.html. Parekh, P. N. (2007). Editorial: Intersecting gender and disability perspectives in rethinking postcolonial identities. Wagadu, 4. Retrieved January 15, 2016, from http://journals.cortland.edu/wordpress/wagadu/archive/v-4-2007-special-issue-intersecting-gender-and-disability-perspectives-in-rethinking-postcolonial-identities/. Parveen, S. (2014, April 23). Rana Plaza factory collapse survivors struggle one year on. BBC News. Retrieved November 2, 2014, from http://www.bbc.co.uk/news/world-asia-27107860. Salinas, M. A. (2013, March 12). Attacks on Albinos surge in Tanzania. Voice of America. Retrieved April 19, 2013, from http://www.voanews.com/content/attacks-on-albinos-surge-in-tanzania/1619907.html. Sexuality and Disability (n.d.). Retrieved December 15, 2015, from www.sexualityanddisability.org. Shildrick, M. & Price, J. (2005). Deleuzian connections and queer corporealities: Shrinking global disability. Rhizomes 11–12. http://rhizomes.net/issue11/shildrickprice/index.html. Symington, A. (2004). Women’s work exposed: New trends and their implications. Women’s rights and economic change (Vol. 10). Toronto: Association for Women’s Rights in Development. Retrieved January 15, 2016, from http://www.awid.org/publications/womens-work-exposed-new-trends-and-their-implications. World Health Organization. (2002–2004). World health survey. Geneva: World Health Organization. Retrieved March 29, 2015, from http://www.who.int/healthinfo/survey/en.